Whiplash is an injury to the neck that is caused by a rapid acceleration and deceleration of the head, most commonly caused by an auto crash. 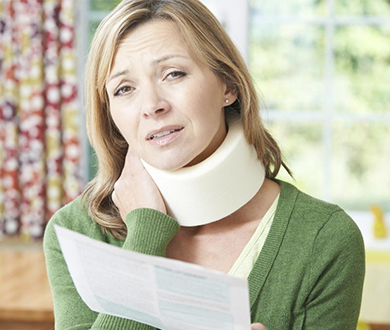 The whiplash motion is typically caused when the vehicle is struck from the rear. This whipping motion has the potential to damage the ligament and discs in the neck, causing neck pain, headaches, hand numbness and tingling, and even injury to the joints of your jaw (TMJ). Unlike a broken bone where a simple x-ray can validate the presence of the fracture and standards of care can direct a health care professional as to the best way in which to handle the injury, whiplash injuries involve an unpredictable combination of nervous system, muscles, joints and connective tissue disruption that is not simple to diagnose and can be even more of a challenge to treat. Phase 1: During this first phase, your car begins to be pushed out from under you, causing your mid-back to be flattened against the back of your seat. This results in an upward force in your cervical spine, compressing your discs and joints. As your seat back begins to accelerate your torso forward, your head moves backward, creating a shearing force in your neck. If your head restraint is properly adjusted, the distance your head travels backward is limited. However, most of the damage to the spine will occur before your head reaches your head restraint. Studies have shown that head restraints only reduce the risk of injury by 11-20%. Phase 2: During phase two, your torso has reached peak acceleration – 1.5 to 2 times that of your vehicle itself – but your head has not yet begun to accelerate forward and continues to move rearward. An abnormal S-curve develops in your cervical spine as your seat back recoils forward, much like a springboard, adding to the forward acceleration of the torso. Unfortunately, this forward seat back recoil occurs while your head is still moving backward, resulting in a shearing force in the neck that is one of the more damaging aspects of a whiplash injury. Many of the bone, joint, nerve, disc and TMJ injuries that I see clinically occur during this phase. Phase 3: During the third phase, your torso is now descending back down in your seat and your head and neck are at their peak forward acceleration. At the same time, your car is slowing down. If you released the pressure on your brake pedal during the first phases of the collision, it will likely be reapplied during this phase. Reapplication of the brake causes your car to slow down even quicker and increases the severity of the flexion injury of your neck. As you move forward in your seat, any slack in your seat belt and shoulder harness is taken up. Phase 4: This is probably the most damaging phase of the whiplash phenomenon. In this fourth phase, your torso is stopped by your seat belt and shoulder restraint and your head is free to move forward unimpeded. This results in a violent forward-bending motion of your neck, straining the muscles and ligaments, tearing fibers in the spinal discs, and forcing vertebrae out of their normal position. Your spinal cord and nerve roots get stretched and irritated, and your brain can strike the inside of your skull causing a mild to moderate brain injury. If you are not properly restrained by your seat harness, you may suffer a concussion or a more severe brain injury, from striking the steering wheel or windshield.